New Effecta, IMA Active’s perforated coating pan, installed in Goerlich Pharma’s facility in Edling, Germany. Goerlich’s range of products is much more than a list of food supplements, dietary food and medical devices. It reflects the work Goerlich does every day to break new ground that makes a difference in the lifes of people. So it is no wonder that the company’s claim is “everything from one source”. This mid-sized, family-owned company is qualified to produce a wide range of formulations, such as hard capsules, tablets, sticks, oil mixtures and supplies also soft gelatine capsules. Goerlich’s services range from production and filling of oral solid doses to liquids and packaging. Whether blister, containers, jars or folding boxes – Goerlich offers also comprehensive packaging solutions, thus resulting in maximum quality of the final, packed product. «The cooperation with clients and partners is founded upon a confidence which we provide and cultivate», says August Wimmer, Head of Production and Logistics at Goerlich. «In the focus of our acting is the aim to manufacture product in excellent quality and economical prices for our partners and clients». Cutting-edge technologies support Goerlich in this challenging mission. For its facility in Edling, southeast of Munich (Germany), Goerlich Pharma has chosen Effecta, IMA Active’s perforated coating pan for coating processes. Launched on the market two years ago, Effecta meets the requirements of the nutraceutical industry, with particular reference to the development and production of customized formulations. What were your requirements for the new coating pan? Contract manufacturing in the nutraceutical industry demands much more flexibility as in the pharmaceutical industry. This refers to batch sizes, frequent product changes on the lines and, of course, speed of delivery. For us therefore a mid-sized coating pan, with a range of ca. 60 to 150 kg filling load was one of the essential requirements, fulfilled perfectly by Effecta coating pan. Additionally, we looked for a coating machine with easy maintenance, good cleaning properties and excellent drying process, the latter saving energy in the process. Again, Effecta was the best in class regarding these features. What were the most decisive preconditions to be fulfilled? Naturally, a uniform and very stable coating and drying process is key. This results in consistent and extremely reliable product quality and is the obligatory prerequisite to meet the high expectations of our customers. Our production facility in Edling, southeast of Munich (Germany), is located in a climatic zone with highly fluctuating weather conditions, regarding temperature (winter versus summer, -20°C to +35°C) and changes of relative humidity (all over the year from 20% to 100%). The most decisive pre-condition therefore was that the air, supplied from outside, for the drying process being always stable in temperature and humidity. The technical infrastructure of Effecta guarantees this in any case and ensures therefore hassle-free products. What was your main reason for choosing Effecta? IMA Active offered to us with Effecta simply the best bundle of quality, productivity and price/performance ratio. Further details substantiating our decision were local German technical service, high competence and reactivity of the whole IMA team and the use of high-grade components (such as Schlick nozzles for the spraying process) and secure replacement parts management in Europe. Although being our first project with IMA, the project period was extremely short. Starting with the initial planning phase to the final installation of the equipment, with first training and instruction on the machine in our facility, it was just a period of 9 months, nearly incredible for such a complex technology. Key for success was the very detailed description by IMA for the technical infrastructure, which was constructed and built by our technical team, and the continuous and in-depth exchange during the real construction phase. Thereby, it was just like “inserting the key into the lock” when the coating pan was connected with the pre-built technical infrastructure. Naturally, when operating the coating line fully by ourselves in the months after installation a lot of technical questions aroused and IMA’s technical assistance was paramount, in competence as well as in speed. To bring it to the point, IMA understood our needs in all facets. IMA is not just a “seller of machines” but a dedicated provider of service, guidance and technical expertise. Which three main criteria do you appreciate the most in Effecta coating pan? First, the extensive technical part of the coating line is completely separated from the coating pan in the production area by through-the-wall installation. Second, the Human Machine Interface is extremely well designed: it provides a clear graphical overview about the whole coating process, indicates clearly the coating step currently performed and can nearly intuitively be used, thus making trainings of operators on the machine fast and effective. 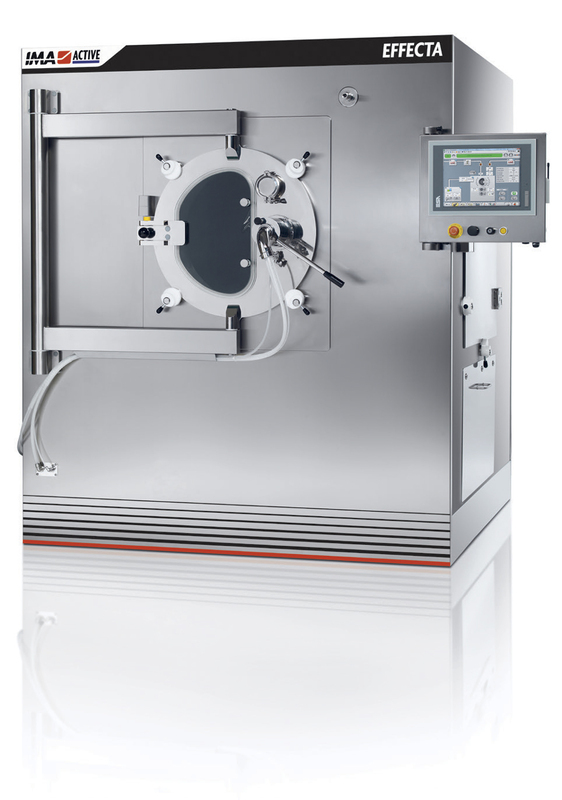 Third, the intelligent design of Effecta coating pan, guaranteeing excellent mixing, uniform drying, clear visual monitoring of the process through a large front window. In short, the basis for an always stable production of high-quality products. On grounds of the top performance of IMA Active in the coating pan project, we decided also to order an additional hard capsule filler from them, the Adapta 100 high speed capsule filler. Adapta 100 offers for us ultimate flexibility as it is able to dose powder, pellets, tablets, microtablets and even liquids into hard capsules. With this extremely flexible machine we are for sure prepared for the future, even expanding our services for our customers in the dynamic contract manufacturing environment. Soft gelatine capsules are a highly accepted solid dosage form and they are sometimes preferred to other forms like tablets, even if these would be the better form for a specific product. An enteric film coating is always mandatory for those solid dosage forms that are inclined to degradation in the stomach, so it is for soft gels. Enteric coatings can be also utilized to deliver Active Ingredients released in the small intestine. In particular, enteric coating of soft gelatine capsules combines the advantages of the delivery system with the protective properties of the functional coating. A further reason for enteric coating of soft gels can be the avoidance of regurgitation, a phenomenon known for very sensitive persons. The first step of process feasibility was performed at the IMA Active Laboratory in Bologna (Italy) using IMA Effecta 200 perforated coating system. The collaboration between IMA process technologists and Goerlich Pharma specialists have led to excellent results from the very first tests, optimizing the process performances. The results gained during the preliminary tests were confirmed afterwards, once the equipment was installed and put into production. In Test 1 a batch size of 60.83 kg of soft gelatine capsules containing natural extracts with a starting weight of approximately 1 gr were loaded and coated. The coating formulation was based on Bonulac F clear (Biogrund Germany) to provide enteric properties on the final coated capsules. The dispersion was sprayed successfully on the capsules by keeping cores temperature between 32-35°C in approximately two hours. Upon completion, the capsules were smooth and perfectly coated. The final achieved weight gain was +6% as suggested by coating supplier. A second test was performed for process scale up by loading 141.75 kg of capsules. Quantitative formulation and its preparation methods were the same as per Test 1, leading to reproducible good coating results. Once again upon completion the capsules were smooth and perfectly coated providing +6% weight gain, as suggested by coating supplier, to guarantee enteric properties. The development of the enteric coating process of soft gelatine capsules can be managed on production sized systems in a controlled lab environment, fine-tuned and scaled up and then deployed at the client’s site with successful Site Acceptance Test and commissioning. The capsules, with their spherical shape, provide the ideal substrate for the functional enteric coating formulation that was used. The final results met the specifications of Goerlich Pharma both in terms of enteric dissolution properties and coating smoothness.